Dr. David Kieber, a professor in ESF's Department of Chemistry, has been named a SUNY Distinguished Professor, the highest faculty rank in the SUNY system. He is one of 18 faculty members recently appointed to the Distinguished Faculty rank from throughout the 64-campus system. Kieberis an international expert in the field of chemical oceanography. His career comprises nearly 25 years of academic excellence in scholarship, teaching and creative activities. He has made a number of seminal contributions to the understanding of oceanic carbon and sulfur cycles (in the Antarctic, the Black Sea, the Mediterranean Sea, the Atlantic and Pacific oceans), the role of photochemical and biological processes in these cycles and the effect of aerosols across the air-sea interface. 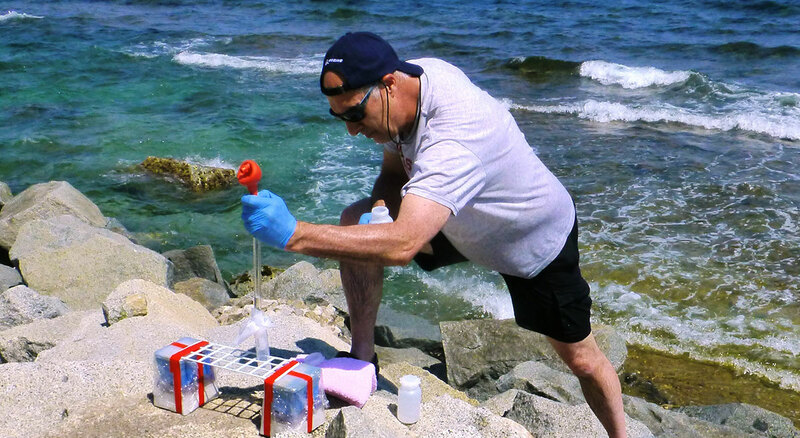 He has made a number of advanced findings in the study of the effects of sunlight on seawater chemicals, reactive oxygen species generation, and the production of volatile organic sulfur compounds by marine phytoplankton. Some of the more significant products of his scholarship include 78 peer-reviewed journal publications in leading publications within his field, including articles in Science, Nature, Nature Geosicence, Limnology and Oceanography, Environmental Science and Technology, and Environmental Chemistry. ESF Interim President David Amberg described Kieber as "an exemplary scholar, scientist, teacher, mentor and colleague." "His pioneering work on sunlight-driven production of biological substrates in natural waters has led to research by scientists globally to try to understand the interactions of sunlight, organic matter and aquatic food web dynamics in both freshwater and marine environments," Amberg wrote, in nominating Kieber. "Additionally, his groundbreaking work on the organosulfur compound dimethylsulfoniopropionate has opened up an entirely new area of research regarding biocompatible solutes and their role as antioxidants in living cells." He has been the principal investigator for more than 25 grants and contracts worth millions of dollars and he has supported and mentored numerous undergraduate and graduate students. He is a leader in his department in science citation indices, indicating that his scholarship is widely cited by the scientific community and that his research has had a significant impact in the field of chemical oceanography. Kieber earned his bachelor's degree from Rutgers University, his master's degree from the University of Delaware and his Ph.D. from the University of Miami. He joined ESF as a faculty member in 1990. He served as associate chair of the Department of Chemistry from 2011 to 2018. The Distinguished Professorship is conferred upon individuals who have achieved national and/or international prominence and a distinguished reputation within their chosen field. This distinction is attained through extraordinary contributions to, and impact on, the candidate's field of study, often evidenced by significant research and/or creative activity. Moreover, the candidate should be a role model for students and other faculty, and their work must be of such character that it has the potential to elevate the standards of scholarship or creative activity of colleagues both within and beyond their academic fields. Their work must be of such quality that students and scholars on other State University of New York campuses would wish to benefit from lectures and seminars, or other appropriate presentations the faculty members might provide. Further, to be eligible for nomination, a faculty member must have attained and held the rank of full professor for five years, and must have at least one year of full-time service at the nominating institution.